Let’s face it, a lot of construction work, any work, can be tedious and boring. There are things that you can accomplish while your brain is elsewhere i.e. digging a ditch, stuffing envelopes, cleaning horse stalls. But some mundane tasks need you to be thinking about what you’re doing, no matter how boring the tasks are. Those are the worst. 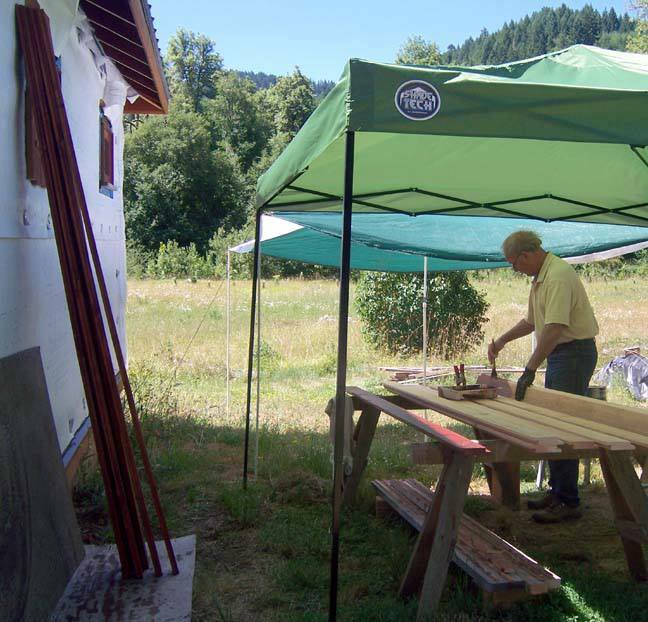 There were roughly 600 Douglas-fir siding boards to stain for our house project. I stained all the surfaces: front, back, edges, and ends. And as I worked, I sorted the boards according to quality and thickness so that when I’m ready to nail them to the house, things should go pretty fast. So, it wasn’t a task I could just do brainlessly. I had to pay attention. But my mind could wander a bit as I brushed on the stain. One of the things I pondered was a similar mundane task I had in my childhood: shucking and shelling corn. We had animals on the farm that thrived on dried corn. Ears of semi-dried corn got tossed into a 20x20x6 foot bin and my job was to shuck and shell the stuff. The bin was full: a bottomless pit of corn cobs all summer long. The job couldn’t be done in an hour, a day, a week, a month. It seemed endless. And summers were long in Texas. Add to that the satisfaction of a finished product: there was none. When I shucked the corn and put each ear into the sheller and turned the crank, the product went directly into a bucket which went to the feed bins. I never got to look over a nice pile of shucked, shelled corn and think about how productive my day was, shucking and shelling all that corn. The results of my efforts were gone. Well, there was milk and meat on the dinner table, but that wasn’t the same thing to a kid who had sore fingers from shucking countless ears of corn. So this mundane task, that took me about a month to finish, at least has something cool to show at the end. 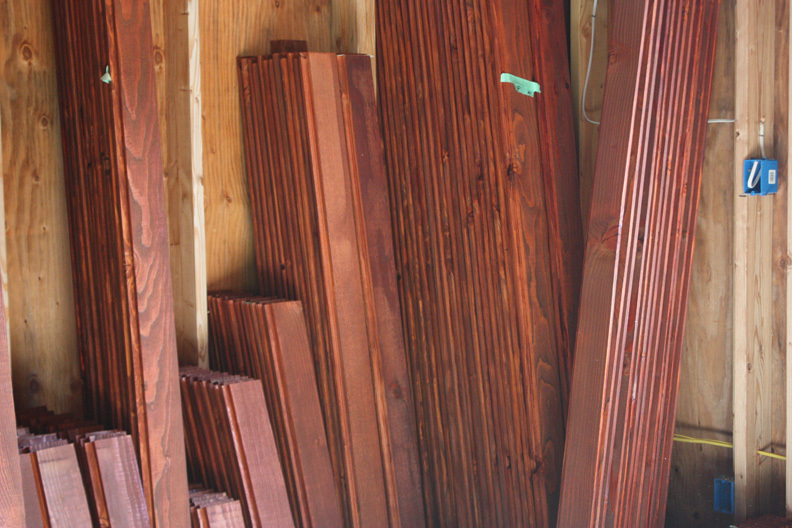 Neat piles of stained fir are lined up in the house, ready to install. Here’s a photo of the piles, a few of them anyway. While a tedious task, I’m glad to have something to show for my efforts.